A movie you simply have to see. Life, Animated was a film I missed at last May’s Chicago Critics Film Festival and I was kicking myself over that at the time. Much of that had to do with how fascinating the story seemed. It has a truly irresistible premise. It tells the story of a young man named Owen Suskind, who is the son of Pulitzer Prize winning journalist Ron Suskind. Owen is a young man diagnosed with regressive autism since age 3, which stunted his development, including losing his ability to speak as a young boy. 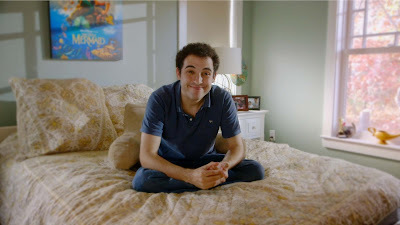 Owen developed an obsessive interest in Disney animated films and, once his family discovered this, they began conversing with him in Disney dialogue, which allowed him to not only regain speech but also help him relate to real situations and connect with others. 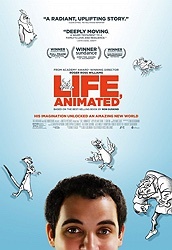 Life, Animated picks up with Owen at age 23 as he’s about to embark on his own as an independent young man, living by himself and keeping a part-time job. As a big Disney fan, I was really taken with this premise. 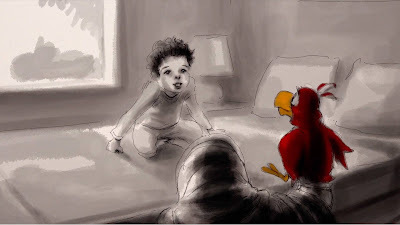 I remember seeing a story on television years back that really tugged at my heart and Life, Animated reminded me very much of a feature-length version of it. It was a story about Equine Therapy, which is a treatment that benefits its patients due to the motor, emotional and sensory sensations that come with riding a horse. When I saw this story, I cried. It was life affirming to see that something, anything, was there that allowed those suffering with Autism to find peace of mind and reap developmental benefits. Instead of horses, Owen Suskind has Disney movies. He gives a speech in the film where he mentions other friends he has with Autism who have different affinities – one is superheroes, another is the lives and careers of Jewish celebrities. It could be anything; anything to help them relate to the world. I roll my eyes when I hear critics and film lovers describe certain movies as “movies for people who love movies.” I often don’t agree with them on their choices, but for Life, Animated I’m going to go against my own rule and call it exactly that. It’s an amazing film, I think, for two specific reasons: the first is that it shows how important film can be in helping all of us process our life experiences and allowing us to heal. The genius of Life, Animated, though, is that it also recognizes that film can only get us so far; we have a lot of work to do on our own. This is brilliantly related in the movie to how at the end of a Disney film, the hero and the love interest kiss (closed-mouthed of course) but never shows what happens next. How do they maintain those relationships etc.? The second reason I think Life, Animated is amazing is because it is a rare documentary that works not only because you’re invested in the subject matter but also because it’s a great examination of that material. Much like Hoop Dreams is about basketball and the lives of two basketball players, Life, Animated is about film but also about Autism, family and life itself. I don’t compare many films to the amazing Hoop Dreams, which should just show you how highly I regard Life, Animated. Too often I see movies that I have difficulty connecting to. The human experience in many of them is absent, as if filmmakers don’t think relating their imagined worlds to the real world is something an audience can respond to. That’s a shame and it becomes magnified when you see something as human as Life, Animated. From the first scene, I was invested in this film and it has moments of euphoric joy that I wouldn’t trade for anything I’ve seen in any other movie this year. Hell, this is a movie that will make you happier to see Gilbert Gottfried than you ever thought you could be. But Autism aside, it does something truly extraordinary. It shows you how any film can become something larger than life to a person who watches it. A movie that might seem like a lark to you might carry enormous emotional significance to someone else and that’s an easy thing to forget. I just saw another, very different, documentary about animation (and obsession) called Persistence of Vision (very much worth seeing), about animator Richard Williams and his “lost” film The Thief and the Cobbler, which is a movie that correctly throws shade on Disney and the film Aladdin for lifting ideas from that movie to theirs. But then you see something like Life, Animated and how important Aladdin was to helping Owen Suskind find his way and it’s impossible to not be thankful for Aladdin’s existence. It’s like in Jodorowsky’s Dune in that the film never being made allowed its ideas to be seeded throughout the sci-fi and action genres in other forms. Its genesis made it possible for these other things to be out there in the popular culture, and that’s a force for good. Sorry for the digression. It was just interesting to me because I saw both movies this month. Life, Animated is one of my very favorite films of 2016 and documentaries in recent years. Find it. See it. You won’t be disappointed. I can barely contain my anticipation to see this. I'm sure my association with Disney and having lived with and around it my whole life, as well as dealing with a disability my whole life, increaes my personal bias on the subject matter, but I think I would find it fascinating no matter what. I'm stoked this is being so well received. I thought it was going to be the usual "pop doc," something light, undemanding etc but it's quite a bit better than that. Looking forward to hearing what you think when you see it. "A movie that might seem like a lark to you might carry enormous emotional significance to someone else and that’s an easy thing to forget"
Absolutely agree. That's why its a bit offputting when people trash a certain movie or band I like. I tend to have a strong emotional attachment to some pieces of art and when people dismiss all the good it can bring, it an awful thing. Totally. I get very protective of certain movies too. E.G. I love the BIG FAT GREEK WEDDING movies. Where some see it as sitcomish (rightfully so), I see them as a worldview we should be striving to be at, full of inclusion and positivity. Thank you for the wonderful review, Adam. My husband and I are so eager to see this documentary. Our 4-year-old son is autistic. He talks a lot now. He didn't used to. I would say that more than half of what he says is dialogue from movies and TV shows he likes to watch such as "Finding Nemo" and PBS' "Curious George." I think "Life, Animated" is going to be a really interesting movie-going experience for us. I have worked with students with autism for 15 years so I thank you for bringing this film to my attention. You're welcome. I think you'll like it a lot. Me, too! Thank you for the review, Adam! Sounds so beautiful. (And I like your last point- can't argue with that). Now it's on my radar I can't wait to see it! My whole family will want to. My youngest sister is now 25 and still has "severe" autism. She graduated from Disney, moved on to Arnold Schwarzenegger movies. When we want her to do stuff we say it in Ahnold voice. That's one thing I was really curious about in the movie. How does Owen Suskind feel about "non Disney" films. Luckily they sort of answer it visually if not in dialogue. Thanks for the review, Adam. Btw, interesting digressions are always welcome. No need to apologise.